The menu changes often, and ranges from vegan favorites like jackfruit tacos to conventional fare like beef sliders. Great dishes are followed up by mediocre ones, service is up and down: careful and attentive during a busy night, and then meandering and slow during a brunch when the restaurant was almost empty. Even Muse’s hours keep changing! (We went one Sunday evening, after consulting the website, and found them closed with new hours taped over the old ones.) Muse is still young, though, and after several variable meals, I have more affection for this restaurant, with its mixture of messes and successes, than for others that are more consistent but less interesting. Part of the reason I am rooting for Muse is that it fills such a needed niche. 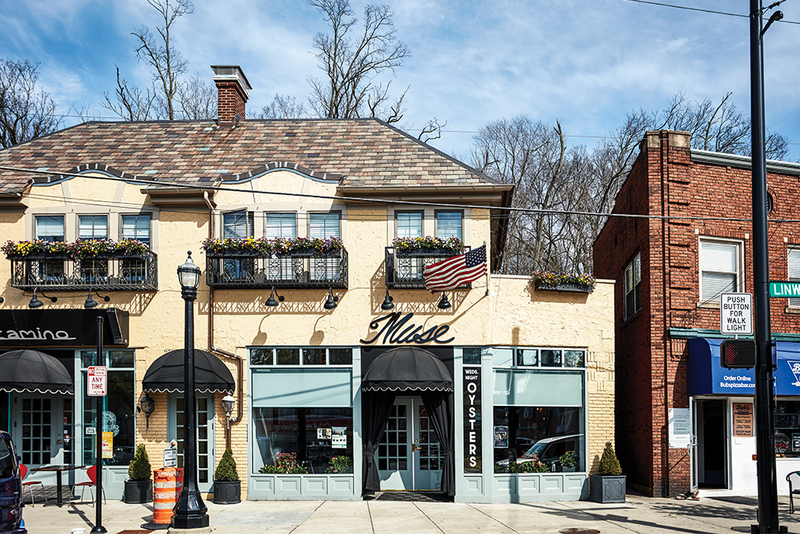 Very few establishments offer a decent selection of vegan and gluten-free options, and what’s there is often served up with a shrug (“Um, here is your pasta primavera”); Muse not only has these dishes but makes them some of the strongest items on the menu. 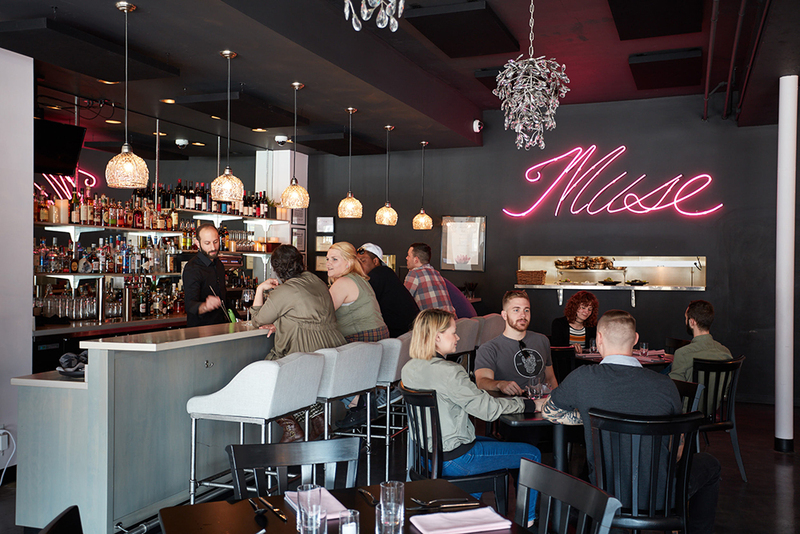 Located around the corner from Zip’s, that anti-gourmet monument of carnivorous deliciousness, Muse is just the funky counterpoint Mt. Lookout needs. One might say that these two restaurants have to face each other for the neighborhood’s chakras to be in balance. 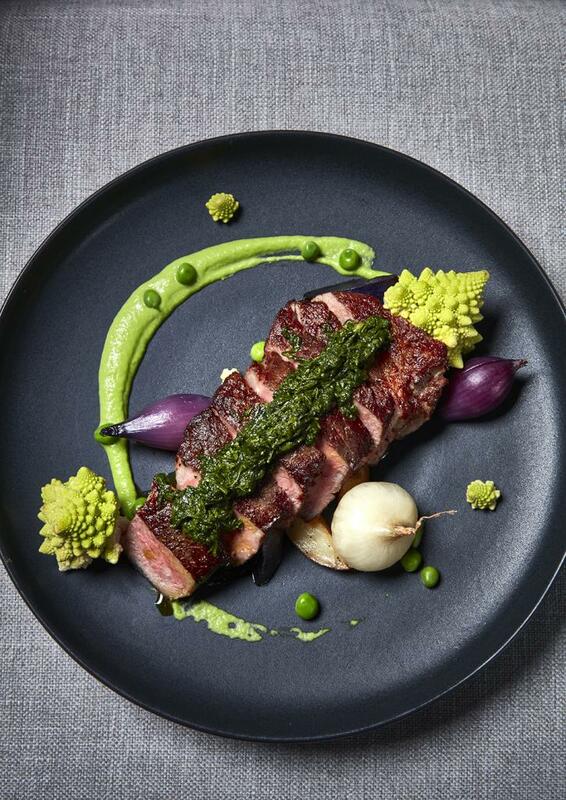 Strip steak dressed with chimichurri, accompanied by cipollini and pearl onions, roasted Romanesco, rosemary potatoes, and pea puree. Muse is owned by Anne Ilyninsky, already a minority owner at the Rooted Juicery in Oakley and downtown. 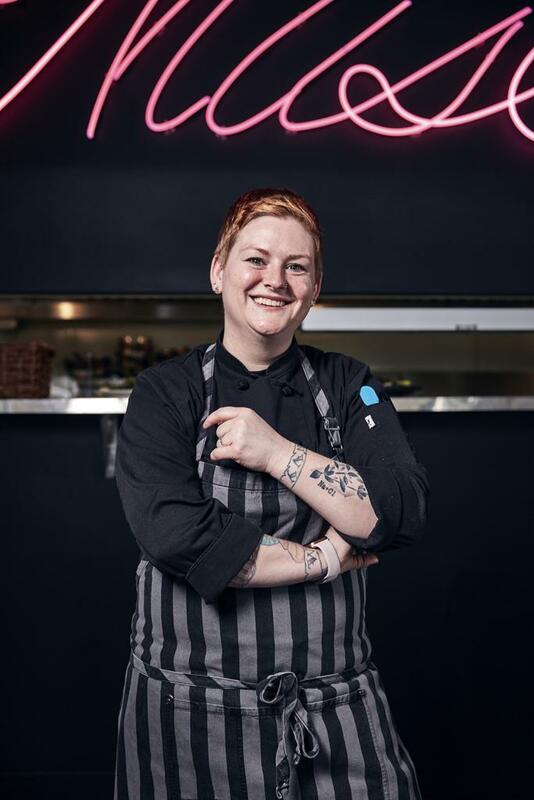 Ilyinsky’s philosophy—as well as that of Chef Jennifer Kempin, who mentioned it when she came by to chat with our table—is a version of Hippocrates’s famous remark that you should let food be your medicine and medicine be your food. 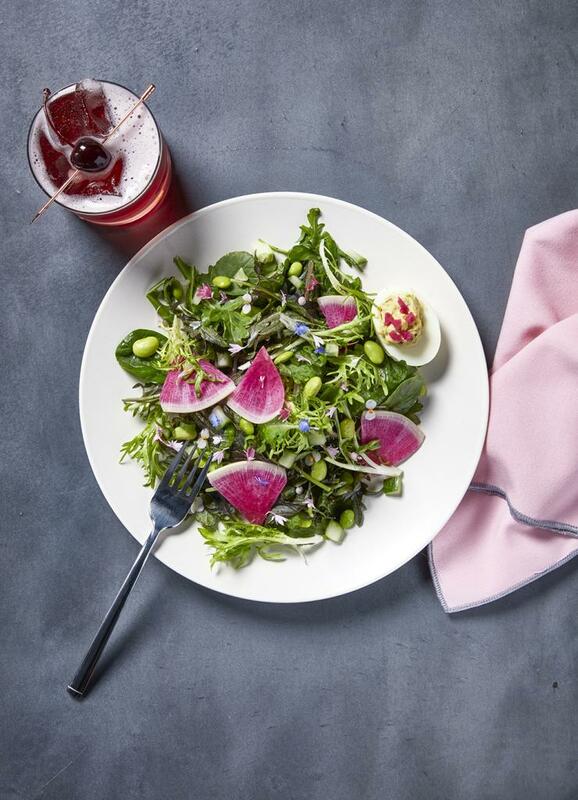 In practice, what this means is that Muse sources a lot from local farms, serves mostly grass-fed beef, has several vegan options, and puts lots of fresh veggies on the side (and sometimes the center) of the plate. I have never been vegan, but have always loved cooking out of vegan cookbooks. When you can’t lean on meat and butter to trigger salivary glands, flavor and depth have to be developed in creative ways. One of my favorite dishes at Muse, for example, was an entrée of stuffed charred leeks. The tube of the leek was hollowed out, almost like a sausage casing, and filled with a sweet and savory mix of raisins and cashew cream, which combined beautifully with the smoky char of the leeks and a vegan Worcestershire foam. Other ideas from the vegan and gluten-free playbooks include baked goods with unconventional flours, and using aquafaba (that’s the viscous liquid from a can of chickpeas) as the binder in the blueberry pavlova, which was crisp and satisfying with a hint of anise. None of these come across as lame substitutes; they are satisfying in their own right, and Muse’s crumbly chocolate chip cookie, with oat flour and maple syrup, is one of the best I’ve ever had. Chef Kempin strikes me as being less inspired by meat. The red meat dishes in particular, from the sliders to the strip steak, are generally satisfying and competently executed, but they lack a certain spark that I found in the vegan and gluten-free offerings, as well as some of the seafood. I loved the shrimp flatbread, with its delicately textured bread topped with bright green garlic and cilantro pesto, and crowned with perfectly cooked shrimp. There was an intensity and clarity of flavor in this dish I sometimes missed in other parts of the menu. When Muse is disappointing, it is often not because of a bad idea, but because an element has been underdone somehow—a carrot pasta is beautifully made, tender and satisfying, but so underseasoned (and with so little basil pesto) it feels almost flavorless. The shrimp in the tacos is marinated with a subtle Cajun seasoning that’s quite good, but buried under a pile of cabbage dressed with lime aioli, you can’t taste the marinade anymore. A few things about Muse are consistent. Every cocktail that we had was excellent (the Cherry Cherry Bang Bang drew particular raves from my friends). 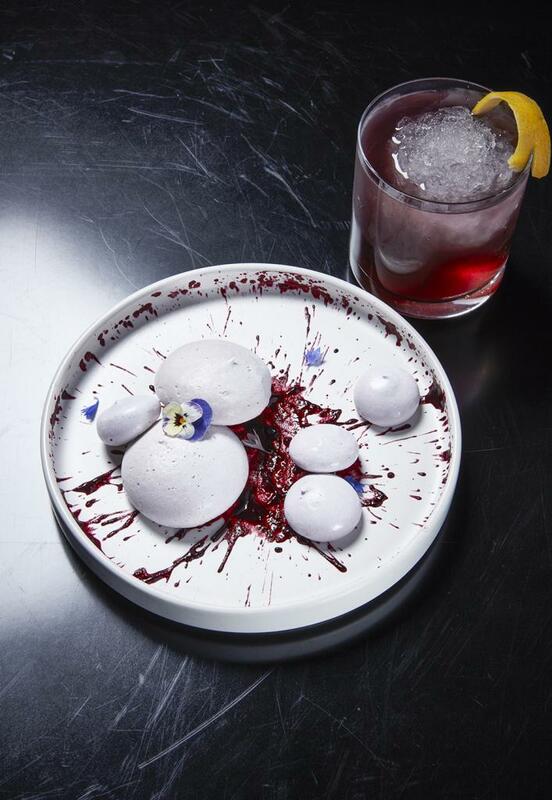 The ingredients are always fresh, and sometimes quite novel (I’ve never seen so many lovely edible flowers). Eating local can produce a few flubs—some blue potatoes on one dish, probably from a nearby farm, were bitter with alkaloids—but the rewards tend to outweigh the problems. And this is basically how I feel about Muse. If you invest in eating from a local farm, you will eventually end up with some rutabagas and have no idea how to make them taste good. There will be baby slugs poking out of your cabbage. But you might also eat a bag of spinach, as I did recently, that moves through your body like a tonic and seems to charge your spirit with fresh vitality. At moments like this, you walk away with a sense that the whole enterprise is worth supporting. That’s what Muse is like. Even though I have very little idea what to expect, for good or ill, at the next meal, I am excited to go back. Lunch and Dinner Wed–Sat 11 a.m.–9 p.m., Brunch Sun 9 a.m.–3 p.m.
Fresh, local, occasionally inspired, and very inconsistent.